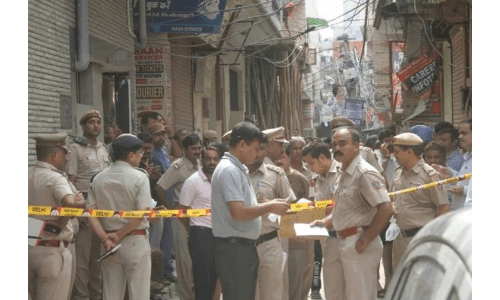 Police on Monday said an occultist and his accomplice were detained for questioning in the mysterious mass deaths of 11 members of a Delhi family on Sunday. Police said it recovered handwritten notes in the prayer area of their two-storey house in Pant Nagar in Burari, revealing a possible mystical connection to the deaths. All but one of the bodies were found hanging from the ceiling. Most of them were blindfolded, gagged and their hands tied behind the back. The oldest, Narayan Devi, 77, was found on the floor with signs of strangulation. The notes hinting at mysticism were found in a diary in the prayer area. The texts of pages discussed spirituality, salvation, rituals and few dates of last month. Articles used for offering in worship such as ghee and grains were also recovered from the house. The police suspect the role of an occultist or a godman behind the deaths. “We are suspecting that the family may have died in a ritual which went wrong,” a police officer said. The officer said the notes had instructions like: “Everyone should be blindfolded properly, nothing but zenith should be visible to the eyes. “Worship the banyan tree for seven days at a stretch with devotion. If somebody comes home, then do it the next day. Choose Thursday and Sunday for this. “If the elderly woman (Narayani Devi) can’t stand, she can lie down in another room. “Use dim light for offering rituals. Offer the rituals between 12 and 1 a.m so that no one disturbs you. The police officer said almost every instruction in the note seemed to have been followed by the family for “obtaining salvation”. One important rule was that the family was to avoid using mobile phones, he said. It took the police a few hours to recover their mobile phones from the house. Vivek Kumar, a neighbour, said the family used to hold religious rituals and prayed regularly every two hours in morning and evening the last few weeks. The deceased found hanging were Narayan Devi’s two sons Bhavnesh Bhatia, 50, and Lalit Bhatia, 45, and two daughters Pratibha, 57, and Priyanka, 33, who got engaged last month. Bhavesh’s wife Savita, 48, and their three children Nitu, 25, Monu, 23, and Dhruv, 15, were also found dead along with Lalit’s wife Tina, 42, and their son Shivam, 15. The Bhatias ran a grocery store and a plywood outlet in the neighborhood. Narayan Devi’s eldest son Dinesh Bhatia lives in Rajasthan’s Kota and another daughter Sujata lives in Panipat in Haryana.